3 days in Lisbon - how to make the most of your time without being rushed! Prior to our arrival in Lisbon, Portugal’s historic capital, we had memories of a previous visit here. It was back in 2004, long before Portugal had ascended to its current heights of tourism demand. Even though it was only for a day trip, having driven up from the Eastern Algarve, we had certain memories that we were keen to revisit. Alas, either the town has changed, or we just didn’t pay as much attention to that trip. The memories of crooked laneways, tiled buildings, and steep steps were relived once more, but for the life of us, we couldn’t remember if we were exploring something new or retracing old steps. This wasn’t a bad thing. It obviously meant that this felt like a brand new city to us and we were ready to explore it. It also re-affirms how you can’t just visit a city once and feel as though you know it. Getting to know a city like Lisbon takes time. This is where I should mention that there are two kinds of Lisbon. Lisbon is a perfect city to spend a weekend break, especially given its proximity to major European and UK cities. A few hours on a plane and you’ll find yourself being welcomed into a city full of colour and fun. The scenes at the airport as we arrived validated in an instant the fact that this city had become a party town. Lisbon has become one of those cities, like Amsterdam or Budapest, that is actively promoted as a great place for bucks (stag) parties. It’s also a destination of choice for many celebrating milestone birthdays and events. Case in point, as we stood to wait for our luggage, we were surrounded by about 20 women, all uniformly attired in “Sharon’s 50th birthday” t-shirts. Stereotypically, these groups will create a certain reputation for the city which isn’t entirely fair, but nonetheless real. The other Lisbon is the one we tried to get to know. The one where the groups of people mentioned above didn’t have an impact, largely confined to their bars and nightclubs. They weren’t the ones heading out in the early hours of the morning for fantastic views over the city, nor wanting to get into every nook and cranny to discover cool places to eat. Lisbon is an ancient city, built over seven hills. This means that whilst there is an abundance of great spots for taking in sweeping city views, it also means walking up hills. Unless you’ve been practising your hill climbs prior to your arrival, the hilly streets can test even the fittest of visitors. For those with mobility issues, you will need to choose your path carefully. Tip: As is the case with much of Lisbon, the pavement surfaces are also covered with the decorative beauty of mosaics, tiles and marble. Add some water to them and a downhill trajectory, and the chances of slipping on these surfaces escalate. It is really important to wear good walking shoes with good grip. I will never forget the time in 2004 when a friend of a friend that we were dining with slipped on a plastic bag in the wet on a Portuguese footpath. She broke her arm when she fell. Leave the fancy shoes at home to improve your chances of staying upright. I loved how the hills provided for the addition of some incredible stairways in the laneways, linking neighbourhoods together and creating a sense of almost secret passageways behind the scenes. There is so much to see and do in Lisbon that you really should spend at least a few days here. We spent almost four days here which was perfect for the start to our road trip through the west coast of Portugal. 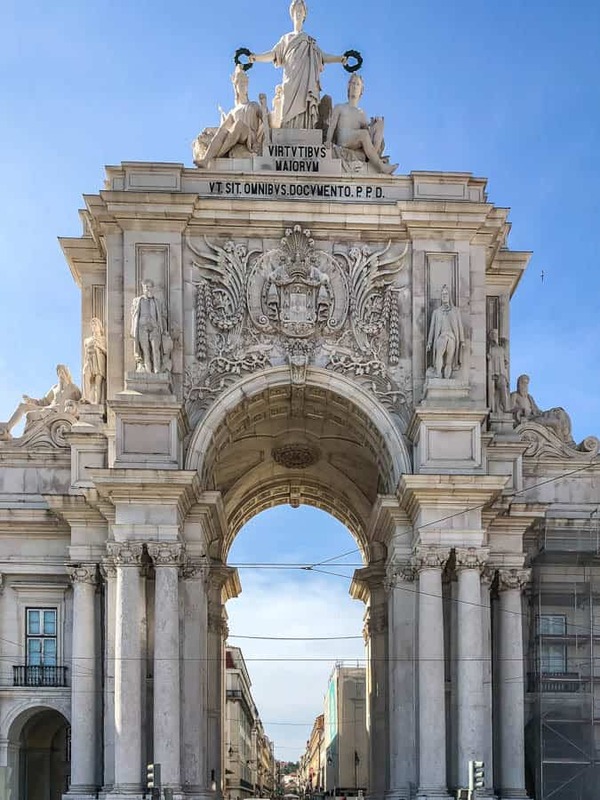 Another point to note about Lisbon is that it is spread out, and the major areas and points of interest that you may want to explore aren’t located conveniently together. There is a good public transport system here, but it is also an easy city to walk around (notwithstanding the hills). Our strategy was to divide our daily plans up into the local area districts, visiting the key sights here and spending the time wandering around the streets, finding all the hidden gems. Tip: Don’t try to see all the key places in Lisbon in one day. It just can’t be done. If you are only in Lisbon for one or two days, select the most important places to visit and concentrate on spending quality time there. Trying to do it all will mean you won’t really see anything. Here’s a rundown of the things we did in Lisbon. All of these were intertwined with cheeky stops at market stalls, hole-in-the-wall bars and other spots that only the locals would know about. The Portuguese love their food and this is evident with the number of markets or mercados in the city. Visiting them was always going to be high on our list. Ever since that last visit, we had always remembered fondly the fresh fish and simplicity of the Portuguese food and cooking. We couldn’t wait to get in amongst it all once more. Want to eat like a local? Do a food tour in Lisbon. The Mercado da Ribeira, built right near the waterfront and in one of the oldest areas of Lisbon is an example of how markets are enjoying a resurgence in popularity. No longer just a place where the locals come to buy their supplies, they are now hip places of interaction, food and entertainment. During the early hours of the morning and up until early afternoon, the outer part of this market is alive with the fresh produce vendors, doing what they and preceding generations have been doing since it commenced in the 1890s. The internal part of the market, known as the Timeout Market, is filled with vendors selling food. It operates all day but really comes into its own from lunch onwards. By evening, it’s the place to be and finding a place to sit at a communal table to eat your freshly prepared meal is like trying to find gold in the middle of the Pacific Ocean. Here you can dine on freshly sliced Jamon and match it with a cheese or two. Add a glass of Portuguese favourite, rosé, and you’ve got the perfect match. Asian food, Portuguese chicken, sardines and anchovies served straight from their colourful tins sit alongside stalls aligned with Michelin starred chefs. Like any good market in Portugal, there’s also a chance to sample the fabulous Pasteis de Nata, the mainstay of their culinary history. These egg custard tarts are divine, but not all are made equal. Here at patisserie Manteigaria Silva, Stirling declared he’d found the best ever. It was also at this moment we decided we would test as many pasteis de nata as we could over the coming two weeks, with an overall decision to be made on conclusion of our time in Portugal. More on that much later. Tip: Scan the food vendors first and make a decision as to what you want to eat and then send someone else in your group off to buy it whilst you scour for and secure your seat. It’s a fun environment to eat in and dealing with food envy is rife as someone always sits near you with something else you wish you had ordered! Dotted throughout the city, providing access to the various local communities, the markets offer a chance to explore the local foods and indulge in that wonderful European culture of a stand-up bite to eat with a glass of wine, regardless of the time of day. In Portugal, they love sangria too, no surprise given its proximity to Spain, and you’ll find plenty of that in the markets also. Ok, I’ve already indicated that we made this a bit of a past time whilst we were here. Fortunately, I lost count after a while as to how many we had actually “tested”. Unfortunately, my photos and video don’t lie. Whilst I am looking forward to bringing you an in-depth review of these tasty morsels, suffice to say that they are an absolute must when visiting Lisbon. With seven hills there is an almost never-ending amount of vantage points from where to get a great view. These locations, called miradouros, are mentioned in any guidebook on Lisbon. What they don’t mention however is that you really shouldn’t kill yourself trying to get to them all, regardless of how each one may be talked up as being the best. They are all mostly equal, with clear views out over the terracotta rooftops. Most of them give 180 or 360-degree options, and all will allow you to look down over the city towards the river. The view from Sao Jorge Castle was one of the best. One of the oldest cities in Europe, and virtually destroyed as a result of an earthquake in 1755, it boasts many interesting monuments and buildings that either survived or were rebuilt in the ensuing years. Once the site of the royal palace, following its destruction by the earthquake, the square became the most important commercial hub in Portugal. Located alongside the Tagus River, it was an essential trading port. Today it’s an area where people flock for events and to meet up with friends. It’s also a transport hub with ferries crossing from here and trams head out to neighbouring area Belem. Almost visible from any location in the city, the 11th century Castelo São Jorge sits in its forceful and strategic location above the town. Running from the arch on the square is Rua Augusta, Lisbon’s pedestrianised commercial street. Here you will find all of the main shopping chains and local boutiques along with services such as banks, cafes and restaurants. You’ll also see your fair share of buskers and people trying to sell you things you don’t need. It is, however, a street full of history. Look up and you’ll see buildings dating back to the period after the 1955 earthquake and under the Millenium Bank, you’ll find old ruins of old Roman Baths which may be seen on a guided tour. It’s also aesthetically beautiful with the typical swirling mosaic design covering the road. 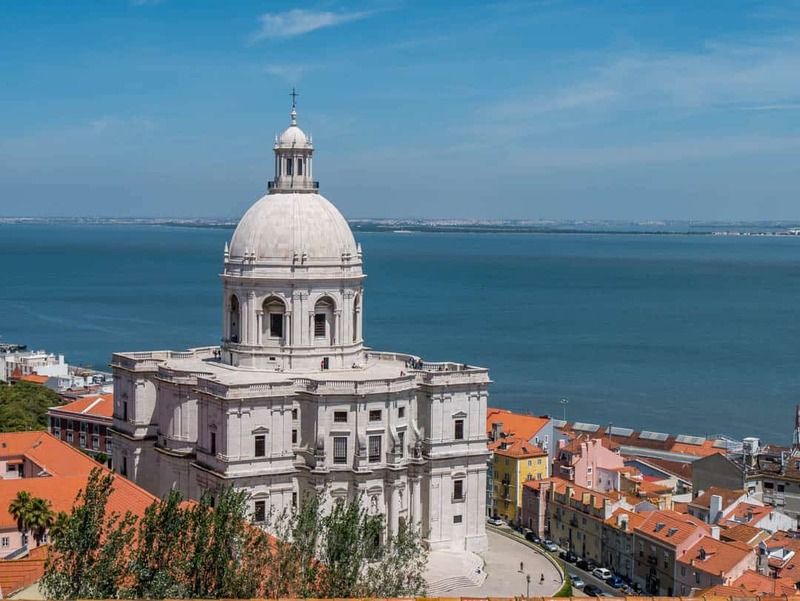 Visitors to Lisbon are encouraged to take the Santa Justa elevator to the top to enjoy views of the city. If you are only going to be in Lisbon for a short time and can’t access the other miradouros, then the view from this part of town is definitely the one to include. I loved the elevator for other reasons. Built out of wrought iron, and reaching far into the sky, it is simply beautiful. Once used to transport people from the bottom of the steep hill in the Baixa district, today locals would keep far away. 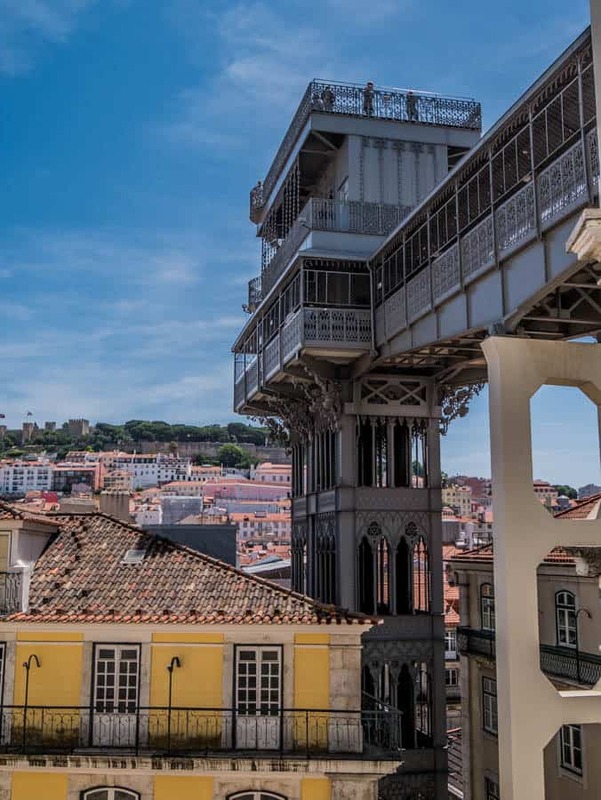 It’s become one of the premier tourist attractions in Lisbon, generating long snaking queues for those wanting to steal a view from the top platform. Unless you really love queues (which I don’t) or you really want to experience the lift (which I didn’t), there’s a faster and cheaper way to get the same view without potentially wasting hours, yes hours of your time. 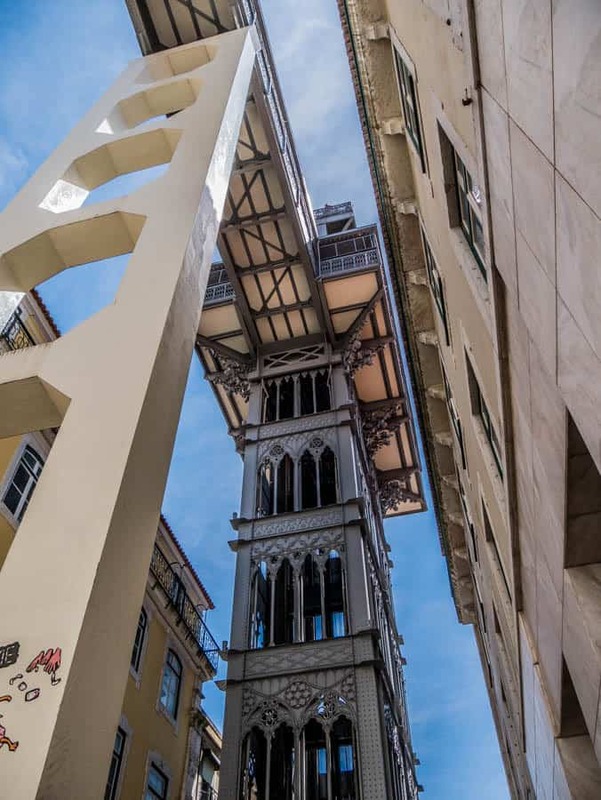 By walking just a few streets, (specifically turn left from the Santa Justa Elevator, then right, right and right again) you can access the viewing platform of the Santa Justa Elevator from the Largo do Carmo. If you wish to get right to the top viewing platform, a small payment can be made here for access. If you need to get back down to where you started, the lift that provides access for the Bellalisa Elevador restaurant can be used for free. This magnificent building survived the earthquake with only minor damage. I shudder to think how much history was lost during this time. Inside the walls are covered with blue and white tiles, once covered up in a previous era, now being carefully uncovered and celebrated. Frescoes adorn the ceilings and a large cloistered area sits in the centre. Climb the stairs all the way to the top and once again marvel at the beautiful view from yet another city viewpoint. <div?I love a city with trams. There’s just something very special about these age-old forms of transport, clunking around on equally ancient tram tracks. 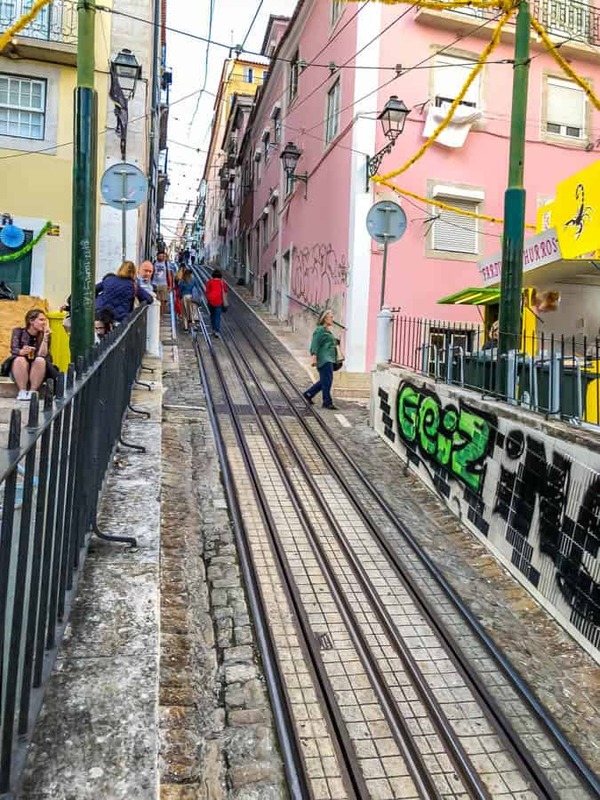 In Lisbon, if the trams aren’t hugging the corners, they are climbing the tight hills. The number 28 tram is an iconic route to catch, taking you through the narrow and often hilly streets of the Alfama district. This one comes with a warning as well. Whilst it is part of the usual public transport route, the bright yellow tram is often the first thing visitors to the city want to do. This means huge queues and long waits as the trams don’t hold a lot of people. If you aren’t one of the first people on board, you’ll also have to stand meaning you won’t get much of a view, other than someone else’s armpit probably. Whilst it got us up to the area we wanted to explore, I wouldn’t go out of my way to catch this particular tram again. If you see photos of this on Instagram you’ll put a visit to Rua Nova do Carvalho at the top of your list. Why? Because it looks gorgeous! The bright, hot pink painted street just makes you want to go and check it out. In 2011, the street was painted in an effort to gentrify an area near the Cais do Sodre railway station that was the frequent hangout of sailors and prostitutes. Now, it’s a funky little area, full of nightlife and bars. But let’s talk about THAT pink. Unless it’s just something that you seriously want to do, I’d give it a miss. Why? Because it’s just not that pink. In 2011 it would have been, proudly showing off its shiny new coat. Today, after years of general traffic, it’s more of a dirty pink, covered with gum and looking very uninteresting. The photos you will see are heavily edited. Check out these below so you know what I mean. Alfama is one of the oldest districts in Lisbon, once the home of dock workers and sailors alike. Today, you can still see evidence of a grungy past, but signs of revitalisation are occurring with funky wine bars and cafes popping up along the cobbled streets. It’s here where I pause to think about the state of Lisbon. When you look closely at it, it’s actually quite a dirty looking city. Many of the walls, particularly in the inner city are covered in graffiti (not street art, although some may view this as one and the same). The buildings show the signs of being in an extremely old city. Worn, tired and dirty, but for some reason, the splashes of brightly coloured tiles and paint seem to give this city its real persona. This isn’t a city that has spruced itself up to be put on display for tourists. This is a real city, full of locals going about their daily business and living in houses that could be centuries old. You’ll see no better example of this than in the Alfama district. We took the tram up to Largo da Graça and then took in the view from nearby Miradouro da Graça. From here we could see the Monastery of Sao Vincente de Fora, so took to the streets and walked on up. Later we walked up the hill to the Castelo de Sao Jorge. Lisbon is a casual city and little pop-up bars exist all over. At the end of a busy day walking the streets, it’s good to pull up a chair, sit in amongst the locals and enjoy a cold beer. If there was one thing on Stirling’s mind when we returned to Portugal, it was to eat Piri Piri chicken. A favourite in the Algarve, it’s not as common up in these parts, so the hunt was on! There are a smattering of places where you can buy dishes imitating this moist, chilli-oil chicken but unless you find the authentic locations, you’ll come away disappointed. In a future article, I’ll share some of our best locations for finding Piri Piri chicken in Lisbon. I keep talking about our first trip to Portugal in 2004. It obviously left a lasting impression on me. I remember our host, Mary taking us into a small village near the resort she owned. Here, in the pouring rain, she pulled us into a hole in the wall where we were faced with the faces of several local men. Suddenly three small shot glasses appeared in front of us filled with ginjinha, a sour cherry liqueur. There’s plenty of opportunities to do that still in Lisbon, or if this isn’t your thing, there’s always plenty of local beers and good wine. We visited Lisbon in June, right in the middle of the Festival of Saint Anthony. The city really comes alive during this time, with parties in the streets every night. By day, the streets are normal, but by around 5 pm, the minibars and portable beer kegs start getting rolled out. BBQs are set up, cooking the strong smelling sardines, and everyone gathers in the street to chat, drink, eat and dance. Seeing grandmothers sit at the front of their house that they have transformed into a portable bar is a sight that continues to elicit a smile from me every time I think about it. The promenade that runs along the Tagus River is a place of great frivolity especially in summer when the sun is out and everyone is feeling happy. The bars and restaurants along here are full and mobile vendors sell organic orange juices and ice cream. It’s easy to participate in such activities, or simply to pull up a chair and take it all in. Whilst you are on the promenade, be sure to pay a visit to the strange rock creations. Only a short tram ride out of Lisbon, Belem should not be missed. Whilst most people will go here for the “famous” Pasteis de Belem and the Belem Torre, there’s so much more to do here. The Aeroporto de Portela, Lisbon Airport provides easy access to the Portuguese capital with regular full-service and budget flights from the UK and Europe. Direct flights from the US and Canada are also possible. Coming from Australia, we flew via Hong Kong and then Paris to arrive here. A heartwarming 47 hours from the time we left home until we arrived in Lisbon. Not for the faint-hearted. Getting to the city is easy via taxi, Uber or the Aerobus. We caught the Aerobus, a shuttle that runs every 20 mins to the Cais do Sodré train station. Travelling by train is possible from within Portugal and also from Spain, which also has connections to other European cities. Portugal can be reached easily by car via Spain. Whilst I don’t recommend having a car in Lisbon, if you are planning on seeing more of Portugal, road tripping is a fantastic way to see the country. Hotels and many of the cafes and restaurants have wifi. If you are needing to stay connected more often, especially if you are road tripping and need access to Google Maps, we recommend a local sim or travel wifi. Public transport is well connected, easy to use and inexpensive. With trams, buses, metros, chair lifts and even elevators part of the public transport system, there are many options to get you around the city. If you are staying for a few days, consider buying a travel card. We walked everywhere in Lisbon, apart from when we caught the Number 28 tram and the tram to Belem. If we needed to go somewhere a bit further afield, eg a restaurant at night, we just caught an Uber. Hotels are in high demand during the peak summer season, so if you are planning a future visit, I’d recommend getting in as early as you can. The usual big chains operate here but there are also many boutique hotels. 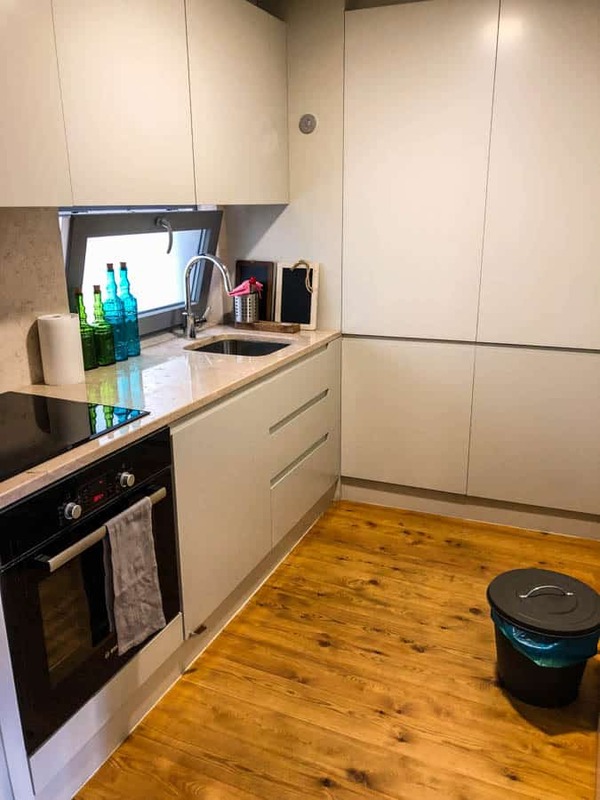 Because we were staying for three days in Lisbon, we wanted to get a taste of the local community as well as having a kitchen for self-catering. We stayed in a local apartment in the Bairro Alto district, right in the heart of everything and close to the Mercado da Ribeira and public transport options. Thinking of going on a road trip through Portugal? You might like to read this.